A wireless mouse that delivers a better mix of precision and comfortwith designed-for-Web scrolling and a feel-good, contoured design. Based on the best-selling shape in the world**, the contoured shape with textured rubber grips keeps your hand happyeven after long hours. The tiny receiver stays in your laptop. Plus, you can easily add a compatible wireless devicewithout the hassle of multiple USB receivers. You get the reliability of a cord with wireless convenience and freedomfast data transmission and virtually no delays or dropouts. From surfing the Web to navigating your Facebook with precision clicking, pointing and dragging, everything you do on your laptop is just easier thanks to our advanced tracking technology. And you dont need a mouse pad either. 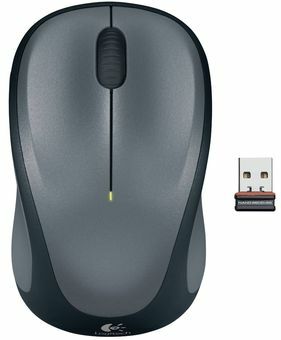 You get the high quality and reliability that have made Logitech the global leader for mice at a price you can affordplus a three-year limited hardware warranty. Your mouse works with Windows®, Mac® and Linux®. No matter what type of computer you own todayor buy tomorrowyou can depend on your mouse to work like you expect.